So what are some trophies or achievements that you find amusing? I honestly like it when developers have some fun with these. One that’s honestly made me laugh out loud was “I did it for the trophy” from Yakuza 0. Which you get by watching one of the live action bikini model videos in the game. Naughty Dog's reference to their demo freezing during E3 2015. Those were fun times. As well as Lollipop Chainsaw "I Swear I Did It By Mistake". It knows its audience. This one from Fallout 4 gave me a chuckle. Metal Gear Solid 2 - Snake Beater trophy. I wasn’t expecting it and I busted out laughing when it popped. Description of the True ending trophy of Bloodborne for the Latin american localization, technically it's NOT mistranslated but the wording is hilarious. The way they worded "You have become a child great one" could be interpreted as "You have become a big boy"
The "This is that part" achievement in Portal 2 still stands out in my head. I was always a fan of 9-Irony, from BioShock 2. You get it for bashing an Andrew Ryan animatronic in the head with a golf club. It's also a throwback to an achievement in BioShock 1, simply titled Irony. 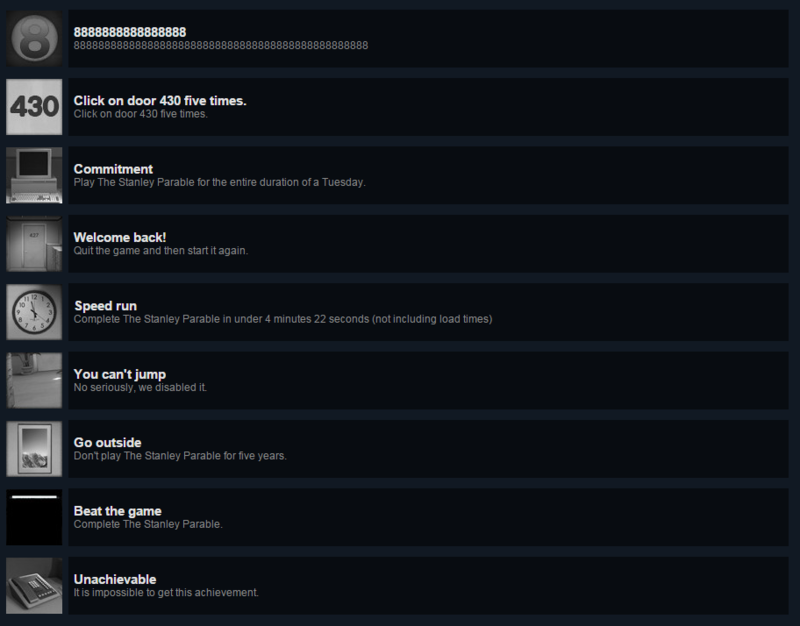 The achievement list for The Stanley Parable is amazing. 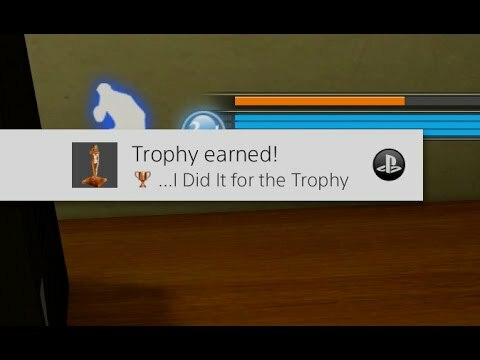 Forgot the trophy name but there was a trophy in Uncharted 4 to replicate the 'dual shock 4 malfunction event' in the Uncharted 4 E3 presentation by just standing there not moving for a few minutes. Also in dark souls 2 (i think), the first time you died, the trophy for that is called 'This is Dark Souls'. One of the few times I really appreciated an achievement system. That scene probably ends up not having that punchline on Switch, not sure how it handled that. "Well, this is the part where he kills us..."
"Hello, this is the part where I kill you!" Star Trek bridge crew has a lot of good references if you're a trekkie. The original red dead redemption had one for kidnapping someone and tying them to the train tracks like a old school villain. Chromehounds had one worth a single point for completing the game on the hardest difficulty, I always liked that. FROM have a sense of humour. I remember one for pressing start in a Simpsons game. Got a chuckle out of me, definitely.